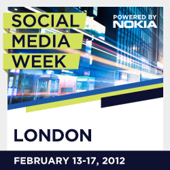 I couldn’t possibly capture the variety of talks and subjects covered within Social Media Week, however, I can confirm that in London there was a fabulous response and show of interest in the 180 events that took place over the week. The events I attended drew people in their hundreds and were full to capacity. Many people attended more than a few events during the week, many tweeted throughout the sessions, causing some subjects to trend and get bemused enquiries from people on Twitter asking why a certain hashtag was trending. If you missed the events, some were livestreamed and can still be watched on the livestream broadcasts page of the SMW website. For the marketing people attending, return-on-investment (ROI) was being proven, and in the many case studies presented, demonstrated how social was being successfully integrated into the wider communications mix. A major talking point was the blurring of marketing functions and the impact of social media was forcing marketers to rethink how it should be managed, and call into question how marketing teams and functions are structured – Who should be doing what? Should online marketing, public relations, offline marketing, social marketing be reintegrated? – These and many other questions elicited comment and tweets from those present, all you need to do is check out some of the Storify threads that have been shared on events such as ‘Social Media, The Olympics & The BBC – Preparing for London 2012’ and the ‘Great Debate – Future of Social Communications’ to get a flavour of the interaction between the speakers and those of us sitting there participating. The outtake of the week for me was that ‘social media’ is beginning to grow up and is being taken seriously. People are beginning to evaluate it’s importance, it’s not just a standalone activity for a few ‘geeky enthusiasts’, but is establishing itself as an important driving force within the communications environment. For me, it’s contribution will be even more far-reaching, and will impact on culture, on business models, and society in a way we haven’t yet fully realised.